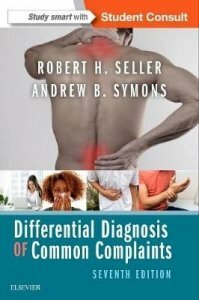 Logically organized around the 36 most common presenting complaints - 80% of what you're likely to encounter in daily practice - Differential Diagnosis of Common Complaints, 7th Edition, uses a practical, clinically oriented approach to help you master the differential diagnosis of common symptoms. Using a clear, consistent format, it walks you through the problem-solving process that most physicians use to make a diagnosis. This book is the ideal reference for the beginning student and the busy clinician. Find information quickly thanks to an alphabetical organization by sign/symptom/disorder and a format that mimics the diagnostic decision-making process in clinical practice. Search the entire text online and find links to self-assessment questions, case studies, and relevant content from other Student Consult titles at www.studentconsult.com. Develop the clinical reasoning and critical thinking skills that are essential for physicians, nurse practitioners, and physician assistants. Student ConsultT eBook version included with purchase. This enhanced eBook experience allows you to search all of the text, figures, references and animations, designed to produce a more rounded learning experience. Stay up to date with evidence-based practice with increased evidence added to each chapter and thorough updating throughout, including the latest clinical and diagnostic studies. Clearly visualize key points in problem solving with new clinical algorithms and updated figures and images.